Discussion in 'General Discussion' started by davidt, Nov 26, 2018. SMITHS EARLY PROMOTIONAL LYRIC BOOK. A rare example of a circa 1984 lyric book. Features 5 pages with printed lyrics to Hand In Glove, Handsome Devil, These Things Take Time (with handwritten amendments in pencil), What Difference Does it Make, Jeane, The Hand That Rocks The Cradle, Suffer Little Children and Miserable Lie. Glad Hips Inc and the office address is listed on last page. Condition is excellent, with minor evidence of rust to staples. Measures approx A4 size. MORRISSEY HANDWRITTEN BIRTHDAY CARD. A novelty birthday card with handwritten note in the hand of Steven Morrissey (and signed "Steven"). Provenance: card was sent in 1983 from Morrissey to Liz Taylor, who designed t-shirts and artwork for The Smiths. To include letter of provenance supplied by the vendor. MORRISSEY HANDWRITTEN POSTCARD AND SMITHS TAPE. An original Rough Trade promotional postcard with handwritten note to verso in the hand of Stephen Morrissey, also to include a cassette of the self titled album alluded to in the note. 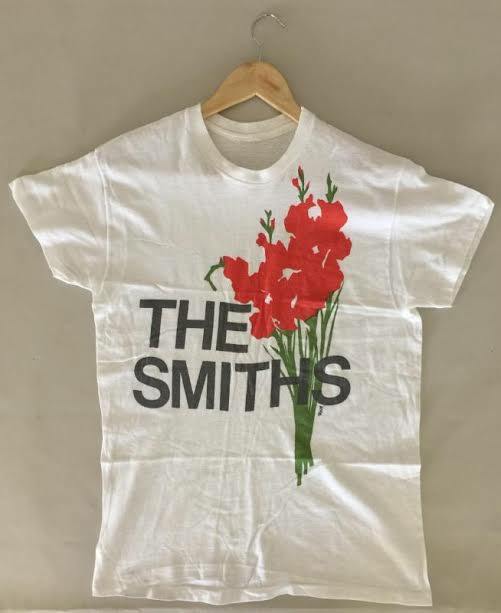 Provenance: note was sent circa early 1980s from Morrissey to Liz Taylor, who designed t-shirts and artwork for The Smiths. the close working relationship between Liz and Moz? Some interesting things on there, might bid for the lyric book.